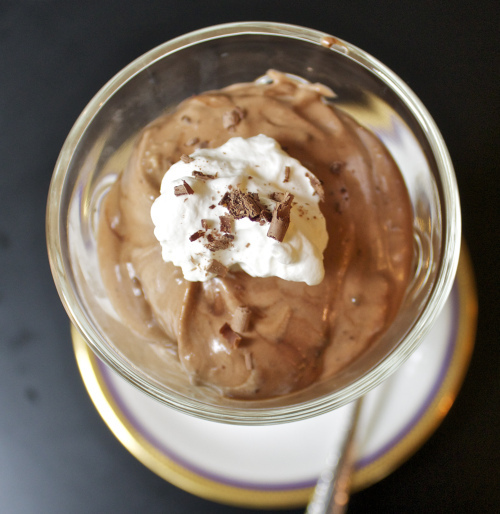 Jamocha Mocha Mousse is definitely not Low-Carb, but tastes wonderful and I will be bringing it to a Bridal Shower later this week. There are hundreds of recipes in cookbooks and on blogs for chocolate or mocha mousse, but this is the recipe I have used since I was a teenager. 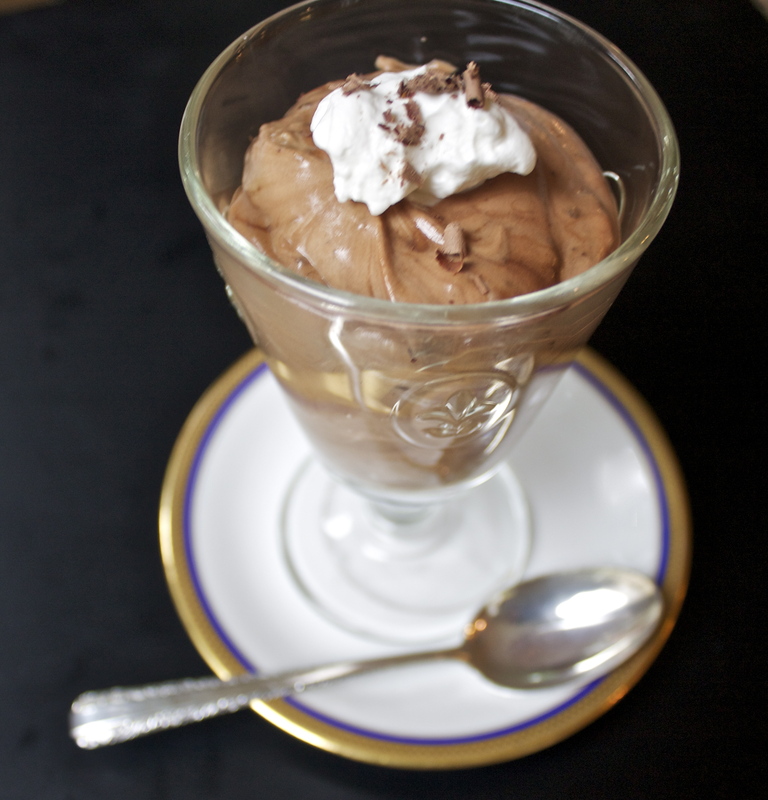 I think I originally wrote it down when watching one of Julia Child’s TV shows, but have tweaked it here and there over the years, and turned it from Chocolate Mousse to Mocha Mousse as I love coffee-flavored desserts. Chop both chocolates into small pieces, so it will melt easily. Separate egg yolks from whites. Create a double boiler using two metal pans and put water in the bottom one – place on high and bring water to a boil. Place the other pan on top and add 4 egg yolks, salt, 3 Tbl. sugar, instant coffee, and the Creme de Cacao. Whisk briskly till it doubles in volume and is silky smooth. Remove from burner and add the chocolate whisking quickly to blend. It can get a little gooey and thick, so add 1/4 cup of heavy cream if needed. Add the vanilla. Set aside until it cooks down to room temperature. Beat the 5 egg whites till fluffy, then add 1 Tbl sugar until stiff peaks form. (Notice you will have an extra yolk hanging around). Beat the heavy cream till whipped consistency adding the remaining vanilla, and 1 Tbl sugar till stiff peaks form. Once the chocolate mixture has cooled down, gently fold in the stiff egg whites, using a rubber spatula. It will have streaks but that’s okay – don’t over blend or you will break down the egg whites. Lastly fold in the whipped cream and again, gently fold until everything is blended together, while keeping the light and fluffy volume. Spoon into glasses or ramekins and top with a dollop of whip cream and some chocolate shavings or chocolate covered coffee bean. I sometimes add a small dribble of Creme de Cacao on top of the mousse before adding the dollop of whipped cream – it just adds another layer of mocha flavoring, which I really enjoy. While this is a rich chocolatey dessert with coffee overtones ….. it remains light and airy due to the egg whites. You can make this one day in advance and it will hold up well. If I am taking this to an occasion, I will leave it in a large bowl and bring my dessert glasses with me and serve it up there – it travels better this way and somehow seems “fresher”. Enjoy! I’m sure the original recipe created a good mousse but you’ve used it to create a chocolatey masterpiece. I’ve a few chocoholic friends who will sing your praises when they see this recipe. Thanks for sharing. Thanks John – what a lovely comment!